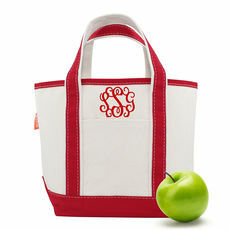 Sample shown using EOIE monogram style with Cardinal thread color. 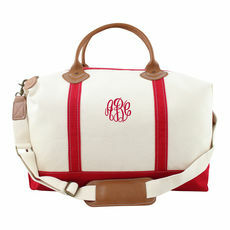 Tote your favorite wines to your next function in style with this natural canvas two bottle Wine Tote with contrasting red trim. This bag includes a detachable velcro divider. Also can be used without the inner divider as a miniature gift bag. 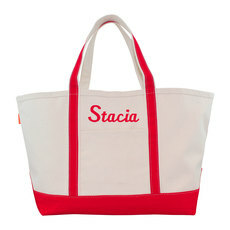 Dimensions of tote is 9.5" H x 6" W x 2.50" D. Your choice of personalization style and thread color. Positioning only as shown.